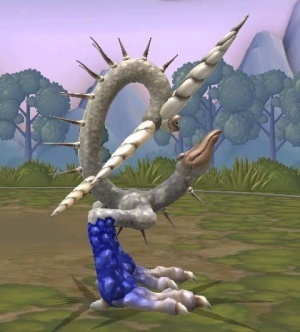 According to a leaked EULA, you may soon see Will Wright's (in)famous creature-building game Spore on Steam. The EULA is here at the moment and strongly suggests that the DRM-hungry beast will soon be downloadable. Though an immediate hit with gamers, Spore took a hammering from gamers on Amazon and others, almost purely due to its DRM and the basic shortness/un-Darwinian progress. Don't expect the game's infamous security measures to disappear though - Steam has published quite a few SecuROM releases with the DRM still attached. Some other reviewers are expressing surprise at this move, but given that EA is Valve's publisher for Half-Life and Left 4 Dead, it really was just a matter of time. We'll keep you posted on any further developments. Updated: 19th December : You heard it here first. Spore, Spore Creepy & Cute Parts Pack, Warhammer Online: Age of Reckoning, Mass Effect, Need for Speed Undercover and EA SPORTS FIFA Manager 2009 have all been released over Steam. Over the next few weeks, so we're told, Mirror's Edge, Command & Conquer: Red Alert 3, and Dead Space will be joining them. It wasn't an immediate hit with gamers. The Creature Creator was. The game itself seemed lackluster and too broad in its scope. Even the FREE creature creator had SecuROM if I recall correctly. What the hell is with that? I never played spore but I recently found a demo in town with the DS version. I like creating things so it did appeal, I'm not sure I'll be getting this, due to the many flaws people keep citing, but I may well give the DS version a proper look. Usually, Steam identifies the DRM included with any game they sell, and the page says nothing about DRM on Spore which leads me to wonder if they're willing to just accept Steam's protection and leave it at that. It might 'cause me to buy the game. Just poked on their forums, one of the moderators confirms - No SecuROM for the Steam version of Spore. Any word on Mass Effect's DRM/Lack there of? Not really interested in Spore but Mass Effect, I'd buy that for a dollar. Mor importantly, any news of whether european Steam gets it? If not is it possible/reliable to make a Steam account and lie about your contry of origin? Wow, this is so sudden. I would have expected at least a month of news about it. I guess they forgot about the over 7500 people who downloaded it illegaly? That should be good news. You might want to update the article for accuracy. If you have been wanting to buy EA games but have been avoiding purchasing them because of EA's use of DRM in their recent titles, a message of Valve's Steam forums states that the EA games on Steam do not use third party DRM or SecuROM set-up, saying, "the only DRM it uses is Steam itself." Sorry to burst your bubble GenHellspawn, but 7500 is a incredible under-estimate. According to "Top 10 Most Pirated Games of 2008" Spore tops that list at 1,700,000 illegal downloads. If spore had been a game of incredible greatness (like it was thought it would be), people probably wouldn't have been so angry and pissed, but since they put such protection on a mediocre game, it was annoying beyond hell. It's like putting 10 keypad locks on a janitor closet door. Any mention of whether or not people who purchased the game on disc can then register it with steam, and then download the non DRM version? I had to completely reinstall my computer after uninstalling spore as it killed one of my drives. Although I don't really know why I'm even asking as it's boring as hell. No, but there is the DRM removal tool from EA. The ultimate irony is that the game was cracked before Spore even came out. Spore sucked, end of story.